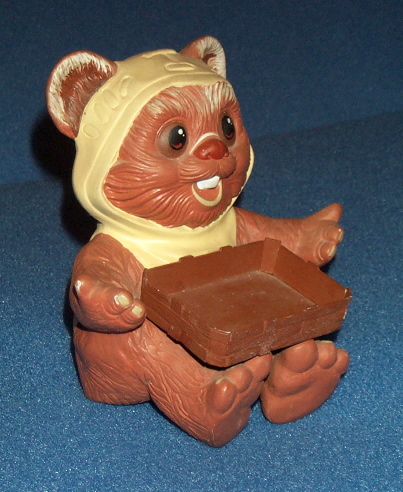 One of the product concepts considered by Kenner in the mid 1980's was this Ewok ashtray featuring Wicket as the lovable collector of ashes. This product was abandoned when it was determined that the target market of 3-6 year olds smoke on the average under two packs a day thereby making this a low-seller. Alright...alright... it's most likely really a soap dish product concept that never saw the light of day. :-) The ewok figure is a hand-painted hardcopy and appears similar to the plastic ewok banks produced by Kenner during the same era. Many product concepts never reach the final stages of production even with a license as popular as Star Wars. Kenner produced very few Star Wars bath toys during the years.